A Late C-Section May Have Caused A Disability in Child. Can I Sue? Home » The Law & You » A Late C-Section May Have Caused Disability in Child. What Next? A Late C-Section May Have Caused Disability in Child. What Next? A viewer was informed that a late Caesarean section may have caused her teenage daughter’s mental disability. Can she still sue the physician who performed the C-section? Birth injury attorneys Greg Fellerman and Ed Ciarimboli tell her what her next steps should be. Dave Kuharchik: Joining us with the answers are attorneys Greg Fellerman and Ed Ciarimboli for “The Law & You.” Guys, as always, thanks for being here. Ed Ciarimboli: We try to have the answers. Dave: Well you always come up with something good, you know? Ed: Well Mary, the first thing that you’re going to need to do in this particular situation is you’re going to need to get the records from not only your daughter’s birth, but you’re also going to need to get the records from your pregnancy. Now, it’s going back 15 years, so it might be a little bit difficult to get those records, especially because a lot of doctors’ offices don’t keep the paper records for more than seven years. But they should be scanned in. They should be some records of your daughter’s birth, some records of the pregnancy, that’s really going to be what you’re going to need in order to have an attorney take a look at this and do an analysis of whether the doctor committed malpractice. The fact that your daughter’s 15 years old, that’s really not an issue or a problem. It’s really going to be more so gathering the information and having somebody taking a look at it. Greg: We say the same things — records, records, records. Obviously, 15 years ago your daughter was having some medical condition. You should gather the records. The law is on your side because she has a right to file a lawsuit up to she’s about 20. That’s the good news. You need to get your records and don’t wait on these types of things. If you have questions, reach out to some lawyers who know what they’re doing. Get the answers you want because you’ve obviously been dealing with this for a long time and when you’re dealing with your children, you always have to be aggressive with this type of stuff. And if you want the answers, you have to go get them. And it’s always gathering the records, getting an attorney, we say that a lot but unfortunately, that’s the way it works. Dave: All right, for viewers that want to talk to you, I know you initially give a free consult. How can they do that? Greg: They can call us at 570-714-HURT, see us on the web it’s 714hurt.com. They can reach out at the hotlines, stop us at the gym, see us on the Square, we’re around. We’re everywhere. Dave: Next time, Greg is having a gyro, grab him. Ed: When he’s riding his bike, just knock him off his bike. Or go to our Facebook page. Post a question and we’ll do our best answering it in an upcoming segment. 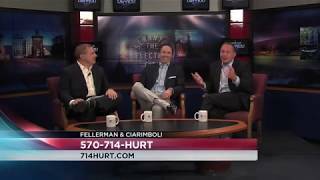 Dave: We almost forgot to get it all in there we’re having so much fun on the “Law & You.” Attorneys Greg Fellerman and Ed Ciarimboli, thanks!